MotoTrans built motorcycles between 1957 and 1983, when it was bought by Yamaha. Many of the bikes were badge-engineered Ducatis, built under licence and with small modifications; others were proprietary designs powered by Ducati engines. The most successful model was probably the Vento 350, the very last motorcycle to use the famous Ducati bevel single motor. Ducati itself stopped producing the bevel singles in 1974, but the engine continued to power the MotoTrans Vento until 1983. (The machine above is an original, unrestored ’82 model produced for the Japanese market, with a left-side gearlever.) The Vento was a popular bike in Spain, and would probably have sold well in Italy too—had Ducati permitted it. The four-stroke 340 cc single breathed through a Dell’Orto PHF 32 AS carburetor, and pumped out 28 bhp—ample for a bike weighing just 134 kg dry, and good for a top speed of around 160 km/h. Unfortunately, the Vento is hard to come by these days, and is surprisingly rare on the classic scene in Europe. 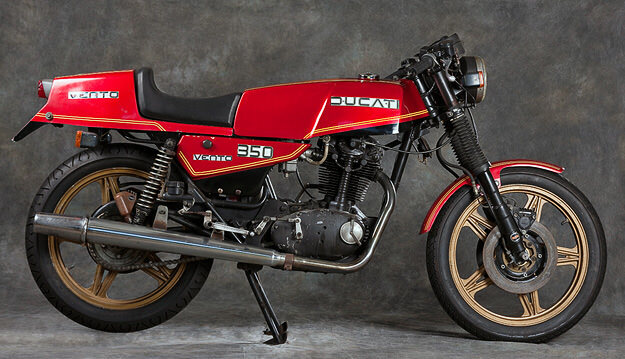 The bike you’re looking at was shot by photographer and Ducati expert Phil Aynsley in Melbourne, Australia; for more amazing photos of rare Italian machinery, grab a copy of his new book Ducati: A Photographic Tribute from Amazon.